To most, summer means pool time, cook-outs, county fairs and camping trips. But, in my recent weekend outing to the lake, we were swarmed with bugs and insects that were just wanting to feast on humans! We got home after that outing and everyone was scratching for days following. That is definitely NOT my idea of summer fun! Since I also don’t like using chemical insect repellents that contain DEET, I am always looking for more natural ways to keep the bugs away from me, my home and my garden! If you’re like me, read on for some tips to naturally repel insects, so you can get back to enjoying your summer! If you have moth issues, natural cedar is a great way to keep them away. Since moths have a natural aversion to cedar, you can buy cedar blocks or shavings and place them in your closet or dresser in order to keep those pesky little bugs from chewing through all your clothes and other fabrics. Experts say that lemon eucalyptus oil is just as effective as DEET in repelling mosquitoes! Lemon eucalyptus oil can also be used to prevent deer tick bites. You can buy lemon eucalyptus oil from this page on Amazon. Do you have an ant issue? Just put some white vinegar in a spray bottle, and lightly spritz areas where ants like to hang out. Make sure to test the solution first if you are going to be using it on carpet or a colored fabric. White vinegar has so many great uses around the house! If you’re looking for a great way to keep bugs from ever getting into your house in the first place, plant some fragrant herbs around both the front and back doors of your house. Not only will these herbs keep insects from making themselves at home, they will also liven up all your dishes in the kitchen! Some great choices are catnip, lemongrass, garlic, mint, citronella, basil and even bay leaves! Now, this tip isn’t as much fun as some of the others, but keeping a clean house is a great way to keep pests out. Make sure to dust regularly, vacuum and wash all surfaces with soapy water frequently to keep pests from making themselves at home in your home! 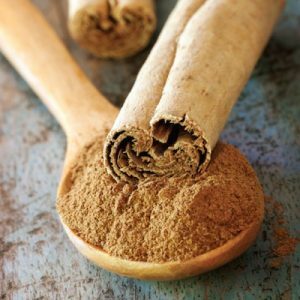 Sprinkling cinnamon around the house is a great way to keep bugs out. Experts say that if you sprinkle the cinnamon in a line around the bugs’ point of entry, they will not cross it! Another interesting tip? Some folks say sprinkling cinnamon in kid’s sandboxes can keep bugs from hanging out in there as well! Some folks might not consider baby powder to be a natural substance, but to me, it’s better than DEET! Baby powder sprinkled all around is said to repel bees and wasps, so you might want to think about it if you have those pests flying around your house! Sounds crazy, but apparently ants are afraid of chalk! Not really afraid, but it’s true that they will avoid walking through chalk! So, if you want to keep them out, draw chalk lines around your house, and they will not want to cross them! Want to keep ants off your kitchen counters? Just slice up a cucumber and leave it laying around! 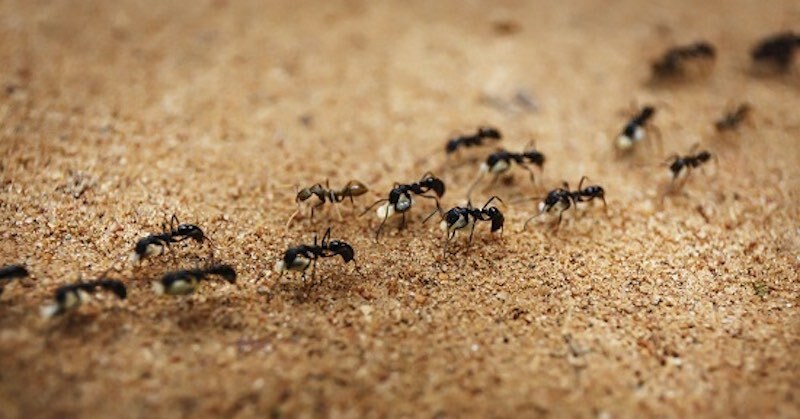 Ants hate it, and they will try to stay as far away as possible! It might sound like an old wives tale, but it actually works! Putting a dryer sheet in your pocket while you are hiking, camping, or gardening can keep mosquitoes, gnats, and other insects out of your way! It sounds funny, but it’s way easier than slathering on the bug spray, and your clothes will smell spectacular! A common insect repellent trick from the senior crowd? Slice up some onions, toss ’em in a bowl of water, and the bugs will run far away! You can also use onion plants in your garden as “companion plants”, to keep the bugs from attacking their partner plants! Cockroaches are naturally attracted to sugar. Take equal amounts of sugar and baking soda, mix them and sprinkle in areas where there are roaches. 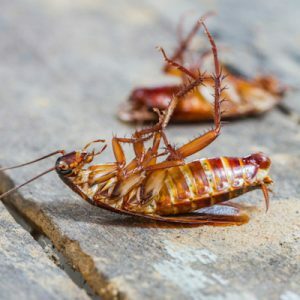 When the roaches eat of the sugar-baking soda mix, the gas build-up will affect their digestive system and kill them. If you want an insect repellent that doesn’t smell like garlic or onions, this one can be a great choice! You can mix vanilla extract with water for a smell good insect repellent! You can also add lemongrass extract, lavender, or mint extracts to the mixture too, and you will be smelling great while you fight off the pests! While you are probably already wearing light clothing, since it’s summertime and all, consider wearing light COLORED clothing as well! Mosquitoes are for some reason attracted to dark colored clothing, so switching up your fashion choices might actually keep the bugs away! Calm down, you’re drawing the bugs! Seriously, though! When we stress, or sweat, our bodies release hormones and pheromones that the bugs are attracted to! So, try not to exercise outside, and if you need to stress out, do it inside in the air-conditioned house! Soybean oil is usually used in cooking, but recent research has shown that it is also a great insect repellent! In a recent study, experts found that insect repellents made with soybean oil kept the mosquitoes away for an astonishing 94.6 minutes, which was WAY more than any other plant-based repellent that was tested! Citronella is a lemony grass-like plant that bugs absolutely hate! You probably already know about it, since it’s found in almost all outdoor candles, torches and lanterns. It is one of the most powerful natural insect repellents! 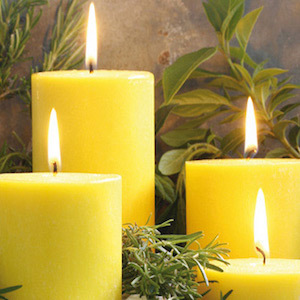 You can buy or make the candles, but you can also plant citronella grass outside of your home, and you can buy the oil and rub it directly on your skin! Bugs are naturally attracted to flowers and fruit, so if you are shampooing with strawberry-mango shampoo and spritzing with passion fruit body spray, you’re probably going to be a hot target! If bug bites are a huge problem for you, try to opt for unscented or fragrance free body products. Mosquitoes like to live in standing water, so you might be inadvertently inviting them to hang out at your home. 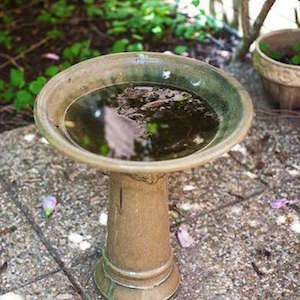 That bird bath or kiddie pool in the yard might look like the Mosquito Hilton! Keep your grass trimmed short and get rid of any containers that might be harboring stagnant water, so your home doesn’t seem so enticing to those little pests!